Wexford County Council in partnership with Creative Ireland launched a new Wexford Films Locations website on Saturday 4th November 2017 with the aim of attracting more film investment into the county. Home to major film productions such as ‘Saving Private Ryan’, ‘The Sea’ and the more recent Oscar nominated ‘Brooklyn’, Wexford county has a stunning and varied landscape with a rich maritime and Norman heritage, and is open for business for film companies nationally and internationally. Earlier this year Film locations Manager Gordon Wycherley, who worked on ‘Brookyln’, was contracted by Wexford County Council’s Arts & Economics Departments to tour the county and do an extensive audit and photo database of locations of particular interest to film companies and film locations managers. The result is an extensive photo data base incorporating more than 4,000 images divided into over twenty categories such as Beaches, Castles, Rivers, Period Houses, villages etc all incorporated into an easy to navigate website. This new website was officially launched by Wexford writer Eoin Colfer and the Cathaoirleach of Wexford County Council John Hegarty on Saturday 4th November. 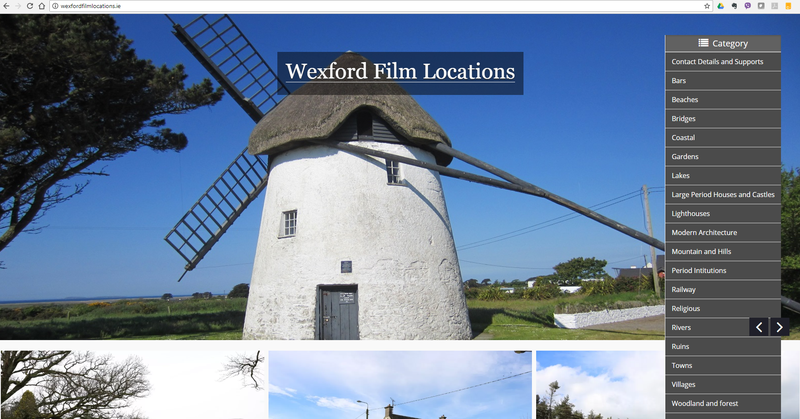 This new website will link to national film websites as well as Wexford County Council and tourism websites. The plan is to develop this website further over the coming years to incorporate opportunities in film and develop a film crew database.